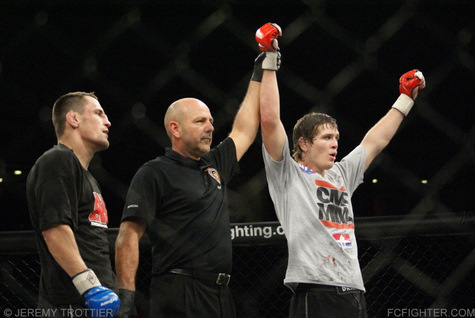 Although Jordan “Young Gun” Mein failed to record his second Strikeforce win in January and had his six fight winning streak end, the 22 year-old remains confident in his abilities to contend for the promotion’s welterweight belt. A key reason being, of course, that one of the three cageside judges on January 7th believed he had defeated the undefeated Tyron Woodley. Victory or not, Mein proved that the highly touted prospect title he’s been carrying is not an overstatement. Now, Mein (24-8) will resume his hunt for a top contender slot, when he fights Tyler Stinson (23-8), July 14th in Portland. Stinson is also coming off a split decision loss on January 7th, as the 26 year-old-fighter had his four fight winning streak snapped by Tarec Saffiedine. Prior to facing Saffiedine, Stinson had lost just twice since 2009, while he competed for C3 Fights, Bellator as well as Strikeforce. Saturday’s card will be hosted by Portland’s Rose Garden Arena and will be broadcast on Showtime.